This wine comes from winery Vujnović, resounding name Plame, made from indigenous croatian grape called plavac mali. Color and nose, Plame will let you think that you have a glass of wine replaced with glass of juicy sour cherries, but above all the typical taste of plavac mali, infused varietal, earthy-fruity aroma definitely will eliminate your doubts. Tannins are very much alive and present, although not wild but contribute to the long and powerful, perfectly focused afterteaste which makes great structure. Another important feature of this plavac mali is that the flavor does not liquefy. 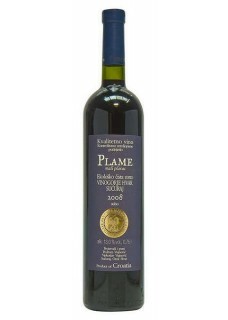 Great drinkability, as the dominant feature of Plame, leaves the impression that this is a nearly elegant Plavac, which is quite typical for the variety. Family vineyards extend in a zone where there is no industry, on the sunny slopes of wine-growing areas of island Hvar.